Advising government on huge design projects that generate 50,000 jobs statewide – including the $11 billion Metro Tunnel and the removal of 50 of Melbourne’s dangerous and congested train level crossings – is not a position for the faint-hearted. Yet Dr Collette Burke is more than up to the task. After all, the Harvard Business School graduate with a PhD in risk management has spent more than 25 years in engineering and construction. She has wasted no time in embracing her new position. Since her appointment, Collette has met with more than 200 stakeholders in industry and academia to boost the progression of Victoria’s engineering sector – a sector counting up to 90,000 engineers and driving a massive 25 per cent of gross state product (GSP). "It’s a role that helps give a collective voice to the profession, but also ensures the government is receiving expert advice on how we engineer our projects," says Collette, "and this is particularly important given the massive infrastructure investment ahead." Massive being the operative word: Victorian Government’s annual investment of $10.1 billion over the next four years is driving unprecedented levels of project delivery activity. "These record levels of infrastructure investment are expected to become ‘the new normal’ over time," notes Collette, "and part of my work will be tapping industry to make sure we’re working in partnership to deliver this ambitious program." Partnership is something she believes needs to be fostered, particularly the sharing of knowledge and ideas between industry and universities. She has established working groups to facilitate collaboration, such as the Engineering Dean’s Forum, a sustainability forum and a committee looking at digital assets and building information modelling. Sustainability is another core focus of Collette’s position. She’s making progress with VicRoads, Sustainability Victoria, local government, agencies and material suppliers to identify projects that will benefit from industry-leading sustainability methods. "We’re also identifying how best to use recycled and waste products as substitutes for natural resources for construction materials," she adds. "Our plan is to increase our understanding of recycled products to be able to modify – and hopefully improve – the standards of local and rural roads." Collette is also playing a critical part in advising on the development and implementation of the compliance and competency registration scheme for Victoria’s engineers – something the industry has long called for. And as if that’s not enough, encouraging diversity in science, technology, engineering and maths (STEM) – especially for young people and women – is on her radar, too. Through the Victorian Engineering Undergraduates Work Experience Register, she’s advocating for more work to attract young people into industry and nurture them throughout engineering courses to ensure they’re "work ready" post degree. The Chief Engineer is the first to admit "we have a problem with diversity in our profession, particularly with respect to the low number of female engineers – statistics show that numbers could be as low as 13 per cent. Significant cultural change needs to occur if we’re to make a substantial impact in this area." As the former Director of the National Association for Women in Construction, it’s an issue she’s "very passionate" about. "I spend considerable time consulting and planning how to address the gender diversity issue," she says, "as we need to boost participation of women in this traditionally male-dominated profession. Barriers to attracting and retaining women to this industry can be structural and cultural. Approaches to date have not been that successful – we need a quantum shift in approach and impact." 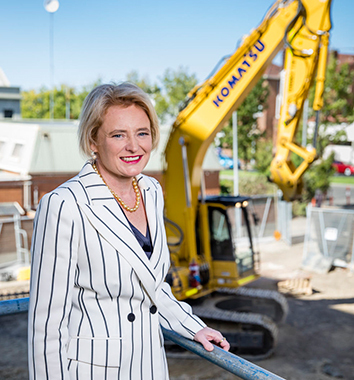 It’s a lot of work to get on with, indeed, but Collette is looking forward to opening up further government and engineering industry collaborations for the state.